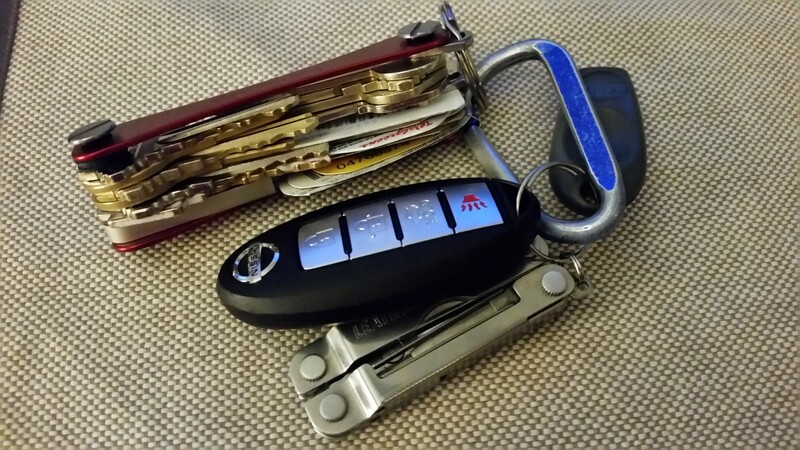 KeySmart Extended version makes my keys a lot easier to handle. 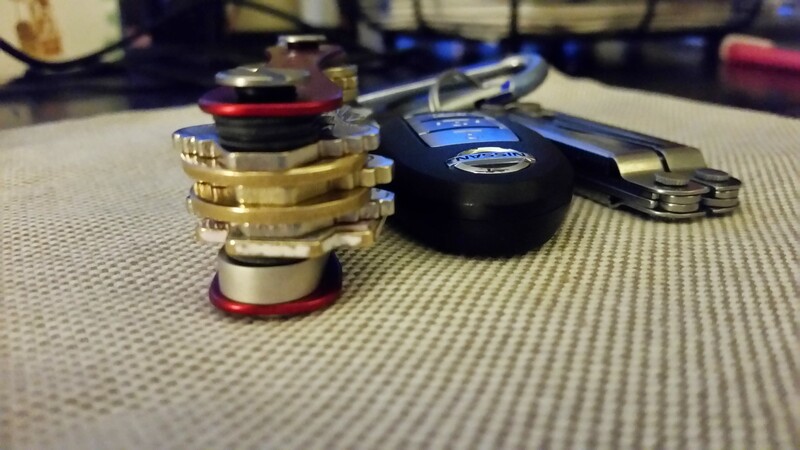 I received my new Key Smart extended quite a while back and forgot I hadn’t reviewed it online. 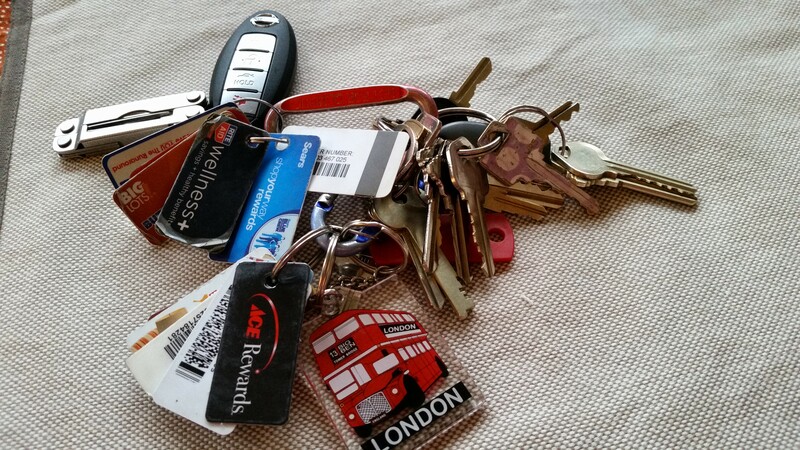 A mess of keys, loyalty cards and stuff that filled my pockets. and then my after neat and tidy stack of keys and loyalty cards. Comparing the height of the Keysmart. I did remove about 3 loyalty cards and trimmed the rest of them so they fit nicely in the device and also removed a couple of keychains, but the end result is a lot tidier and much easier on my pocket. I also splurged and got the USB key fob (the larger silver device at the bottom right of the third picture so I always have some data storage handy. This new version of the keysmart seems to be sturdy with the expansion pins holding up well (too well – I had to use two pliers to pull two apart when I made it too big). At first I was concerned about how easy it would be to get the required key out, but they rotate very easily (possibly a little too easily) and as long as your keys have distinguishing features you can tell them apart easily. If they don’t – get some permanent markers or nail polish. I kept my work keys on one end at the top and my house keys on the other end at the top so they are the easiest to get to and I know where they are. Starting at $21 for the extended version I have here you can also get 15% off at getKeysmart.com (affiliate link). Note that I did buy my own KeySmart and also purchased one for Brandi too. I used to use Keyring on the android for all my loyalty cards but had issues with the lasers being unable to scan the cards on the phone. Nowadays most places also just ask you for your phone number or alternate id, so it is rare that I even use a loyalty card – I think the last time was at the Gas station to get my 3c off at Shell as like most gas stations, it does not have NFC for card payment and no barcode scanner (although the shell one doesn’t even have a barcode anyway.